Sisters, OR ~ On June 27, 2019, the Sisters Folk Festival will present Josh Ritter & The Royal City Band at the Sisters High School Auditorium in a fundraising concert for “Connected by Creativity,” a capital campaign of the Sisters Folk Festival, Inc. Tickets will go on sale to the general public April 17 at 10 am and are $35 – $60 + fees each. The Sisters Folk Festival has been conducting a capital campaign for the past year to purchase the Sisters Art Works building and the adjacent land, which serve as the largest venue for the annual Festival and a community space for events throughout the year. The purchase of the building will allow Sisters Folk Festival to secure their largest venue space, provide a dedicated “home” to execute their mission of enriching lives through arts and music performance and education, and to create new ways to serve the community through programming with adults, after-school and underserved populations. “The ‘Connected by Creativity’ concert is a great way to educate the public about our mission and add to the excitement for the closing of phase one of the Capital Campaign,” says Creative Director Brad Tisdel. Ritter, who sold out his last performance in Sisters during SFF’s 2018 Winter Concert Series, was excited to be returning to Sisters and will be meeting with donors to the Capital Campaign for a pre-concert VIP experience. Opening the evening will be Sisters Americana Project alumnus Slater Smith with multi-instrumentalist Tim Karplus. As leader of the Portland-based folk-rock band The Weather Machine, Smith will be releasing his third record in 2019, a concept album celebrating the Oregon Coast in commemoration of the 1967 Oregon Beach Bill. Ticket sales and donations the night of the celebration will support the campaign, which has raised over $1.1M of the $1.4M phase one goal of purchasing the building. Early-bird tickets will be available April 16th for current SFF Folk Arts Circle members and Sponsors. 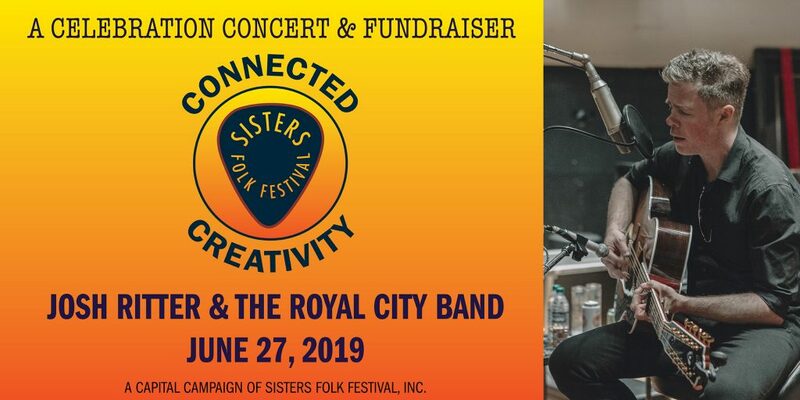 For general admission and reserved seat tickets to the Connected by Creativity concert with Josh Ritter and The Royal City Band, please visit sistersfolkfestival.org. For ticket information 541-549-4979 ext 3.